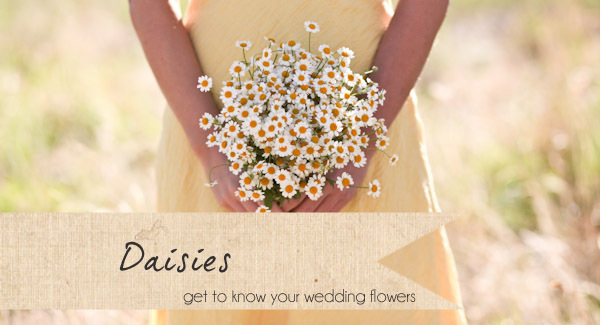 This week on Get To Know Your Wedding Flowers, Karen Morgan of Passion for Flowers talks all about daisies. 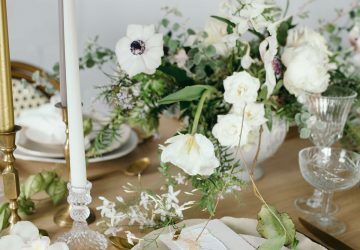 Daisies add a real summer feel to your day, read on if you are looking for inspiration on how to include daisies into your wedding. Daisies or Marguerites are the most common daisy flower with classic yellow centred daisy with a single row of white petals. At Passion for Flowers we also love Asters commonly known as Michaelmas daisy or September flowers. Tanacetum or Feverfew a more delicate variety of daisy type flower is also a great favourite for just picked weddings. What season are daisies available in? Generally available as cut flowers all year round – Marguerites are often sold as plants during the summer months. Would daisies look good in a bridal bouquet? 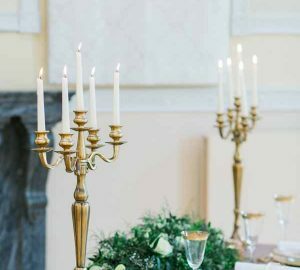 Daisies look good in relaxed hand tied bridal bouquets either en masses for a beautiful white bouquet with a touch of yellow or as part of a mixed bouquet with other seasonal blooms, anemones and ranunculus make a good combination and for a yellow and white wedding make sure you include yellow Billy balls or craspedia. 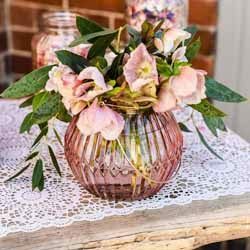 For a bright wedding we love them clashing with the coral charm peony. Could daisies be used in button holes or corsages? Daisies do not stand up well to wiring but they are perfect for just picked button holes finished with hessian or twine. 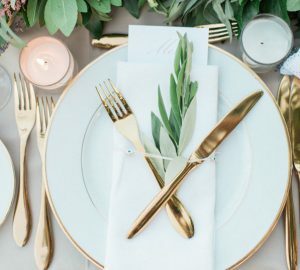 We love making a selection for our wedding guests to choose from. 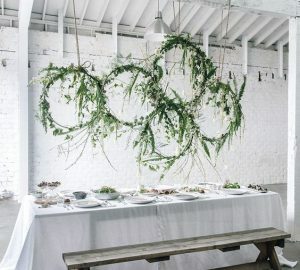 What style of wedding do daisies work with? 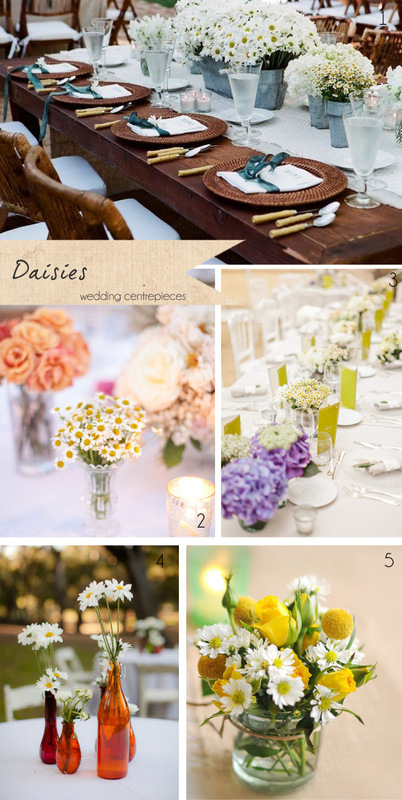 Daisies work with country style or just picked weddings offering a relaxed look and feel to the day. For some wedding work brides ask for large daisy type blooms and actually mean gerbera daisies. These are available in a wide range of colours and are relatively inexpensive. 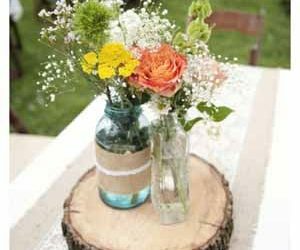 How can daisies be used as table centre pieces? 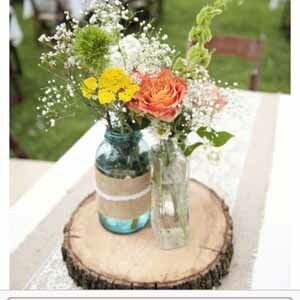 Daisies can be used in informal table centre pieces in bottles and jars. For a relaxed but more contemporary look put large daisy displays in metal containers running down the table centre. What colour do daisies come in? Daisies or marguerites come in white, yellow or pink. Asters or September flowers come in white, pink, pale lilac, deep lilac and purple. Tanacetum or Feverfew comes in yellow, lemon and most commonly in white. How else can I use daisies at my wedding? 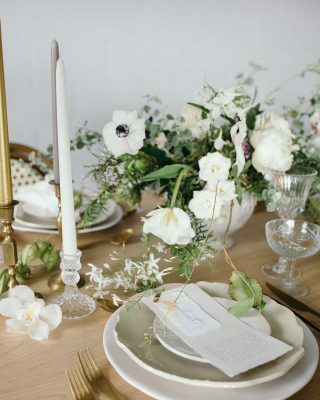 For a relaxed meadow look to your table add daisies to the place setting with herbs, or use for delicate head dresses, although in my opinion these are often too soft for wiring and may not hold up during the day. 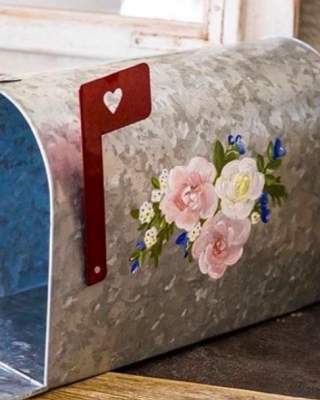 Daisies included in simple cake decoration add a touch of rustic or country feel or add a huge bunch on a display table as a warm welcome to your guests. Do you have any conditioning tips for using daisies? Re cut stems and stand in clean fresh water which should be changed daily. 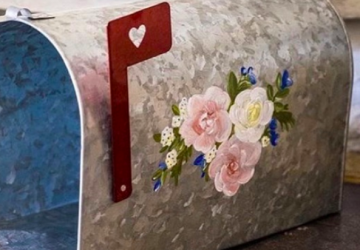 Add flower food. Remove any leaves in contact with water. Keep in a cool spot with good circulation of air. With tanacetum or feverfew take care as it can be an irritant to skin.